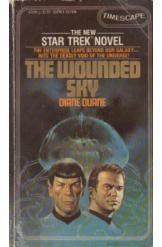 The Wounded Sky by Diane Duane, Sci Fi. Book is in good condition, all pages intact. Captain Kirk and his crew are chosen to test the Intergalactic Inversion Drive, an engine system that will open up entire new galaxies for exploration. Though the Klingons try to sabotage the experiment, the real danger comes after it succeeds, and the Enterprise crew realize they have put the universe itself at risk. A Star Trek novel.